Josh Keyes has an eye for the post-apocalyptic, dystopian future, painting in a way that causes our brains to run circles around itself. Take a peek inside to see his incredible artwork. Oakland-based artist Josh Keyes has set the art world on fire with his controversial blend of man and nature. 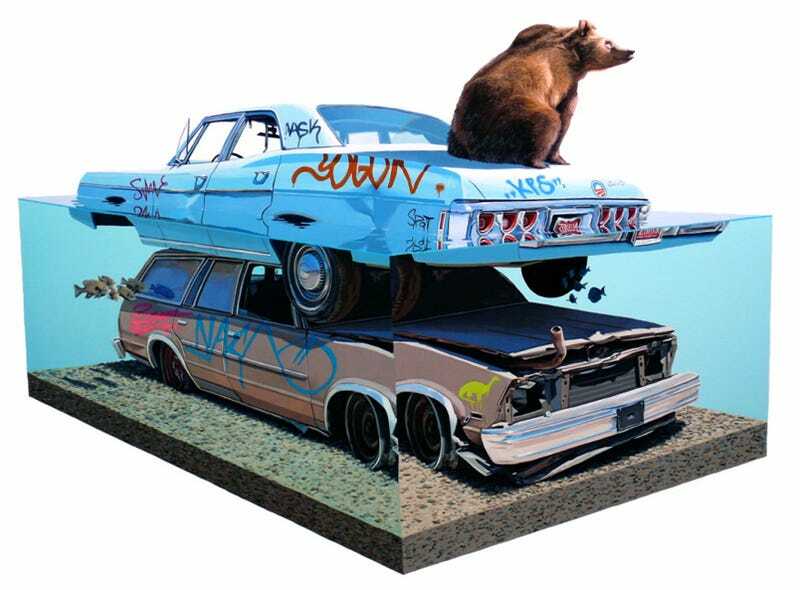 Born in 1969 in Tacoma, Washington, and trained both at the School of the Art Institute of Chicago and later at Yale University where he received his MFA in painting, Keyes has an impeccable eye for nature, and it comes out dramatically in his work. His paintings blend real and surreal elements into one ever-growing style that distinctly resembles natural history museum dioramas and cross-section illustrations from vintage science textbooks. Environmental awareness and the common space we share with different cultures and organisms, is the backbone that supports the different themes and ideas I explore in my work. It is in places in the world where the human touch encroaches on the natural environment are of great interest to me," says Keyes. "Areas where rain forests collide with the logging industry or the fracture in our own back yards where a sidewalk or street ends and an ecosystem or biome emerges. Areas where cement meets rugged soil and grass, or a displaced bear roams far from their natural habitat. It is in the ever-growing human fingerprint that calls into question the value and importance or lack thereof that we assign to the natural surroundings. The fundamental core of my inspiration is a combination of interests that I have had since childhood. My curiosity and admiration of the biodiversity and complexity of the natural world has if anything increased over the years. Reading Ernest Callenbach's Ecotopia and Rachel Carson's Silent Spring many years ago also helped to shape my ideas. This has been mirrored with my concern for their protection and sustainability. These concerns have led me to investigate a wide variety of topics that weave through current environmental issues, ethics, global politics, and try to make sense of a fractured and distorted account of world history and events. In terms of personal style, I have always been attracted to the visual display and interpretation of information. I have a fascination with the scientific or objective view of the world, the way in which it seems to fetishize animate and inanimate things in the world. The way it separates the observer from the observed. It is this separation that interests me. I personally believe that this way of seeing and thinking about the world is the root cause to many of the problems and issues that we are faced with today. The idea or concept that evolves into a painting or sculpture can happen in a moment, or over many years of thinking and pondering. Something Mel Bochner, artist and critic, told our critical issues class at Yale was, "Artists get some of their best ideas when they are not working." I think there is a lot of truth in this. Sometimes when I am trying too hard to come up with an idea nothing happens, then, while walking through the produce at a farmer's market I will be struck as if by a lightning bolt with a clear idea for a painting or sculpture. Another element is timing. Some of the ideas I have are sitting in the pages of my sketchbook waiting for a specific technical development in the way something is rendered like water, or I need more clarity and objectivity of an idea. Keyes' work suggests what the world might be like in a future where current global warming predictions have come true or an untold disease has wiped the planet clean of humans but left all their belongings behind. His paintings portray a world as told by Richard Matheson in his book, I Am Legend, and do it much better than the movie adaptation ever did. We look forward to seeing future works from Keyes and we're sure that you'll feel the same. But, in the meantime, if you're interested in purchasing any of Josh Keyes' prints, you can do that HERE.